The ribbon cutting of a new trail between Wolfville and Grand Pré National Historic Site on Saturday, October 14th marked the completion of the 110 km Harvest Moon Trailway (Grand Pré - Annapolis Royal) and a brought the Blue Route provincial cycling network to a new total length of 437km. The Harvest Moon Trailway joined the Metro/South Shore's Rum Runners Trail and Inverness' Celtic Shores Coastal Trail as the third regional destination trail in Nova Scotia to become part of the Blue Route in partnership with Bicycle Nova Scotia (BNS). "One of the most important things we do to support growing interest in bicycling is help create routes that are safe, comfortable and well located," says Ben Buckwold, Director of Bikeways and Blue Route Implementation with BNS. BNS supports the development and designation of safer bicycle routes on road and trail through the Blue Route project, to form a continuous network connecting communities across Nova Scotia with better places to ride. Blue Route Concept - 3,000 km of connected bike routes. BNS is developing the Blue Route in collaboration with all three levels of government and local community organizations. In 2016, a contribution of $800,000 was awarded to BNS's Blue Route development work by the Atlantic Canada Opportunities Agency. As of 2017, $440,000 of that contribution has been invested in Nova Scotia's three destination trails for new construction and trail surfacing projects. Contributions from the Province of Nova Scotia, Town of Wolfville, the municipalities of Annapolis County and Kings County, and the Off-Highway Vehicle Fund also supported the work. "We are so fortunate to be working with the developers of the Harvest Moon, Celtic Shores and Rum Runners trails, who have created some of Nova Scotia's best examples of infrastructure that appeals to cyclists of all ages and abilities," says Buckwold. "These facilities have the security less confident riders want, beautiful scenery and provide great access to communities". 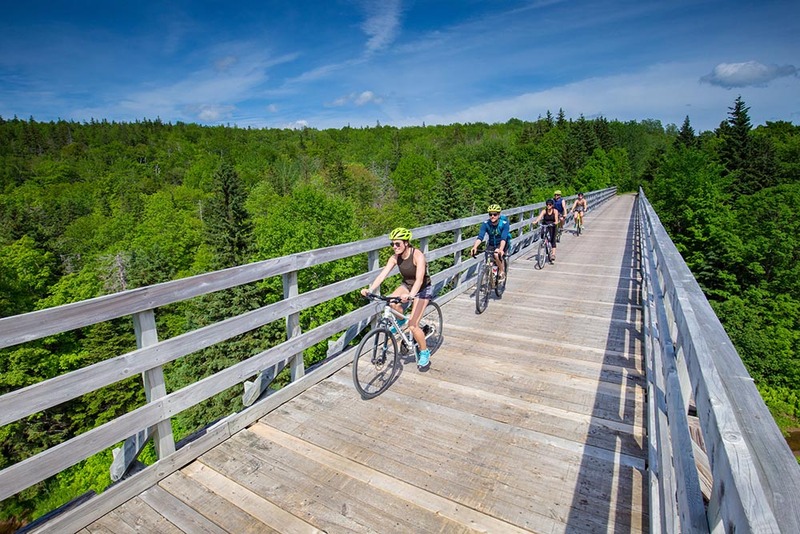 The trails are popular with all kinds of riders, from people enjoying outdoor physical activity and safe bicycle transportation routes away from cars, to tourists who want to explore Nova Scotia on comfortable bicycle adventures. The Annapolis Valley Trails Coalition is counting upwards of 500 users per day on the brand new Wolfville - Grand Pré section of the Harvest Moon Trailway and the Rum Runners Trail Committee counted over 98,000 trail users, 65% of which are cyclists, over a four month period in 2016. The trail work accomplished in 2017 brings the Blue Route to a total length of 437km across Nova Scotia, with 327 km of trail matched by 110 km of routes on secondary highways with paved shoulders and low-traffic rural roads, developed by the Nova Scotia Department of Transportation and Infrastructure Renewal. The fully envisioned Blue Route includes 3000km of connected, continuous bikeways, much of it awaiting future investment in safety improvements and construction before it will be opened.